There are many ways to lend a hand at Inner-City Arts! Every day, more than 450 children walk through the doors of Inner-City Arts to paint, dance, sing, build and discover. Without the help of our amazing volunteers, we would never be able to offer so many creative opportunities for LA youth. Because Inner-City Arts offers a robust variety of education programs and community events, there are a number of ways to get involved depending on your availability, interests, and desired experience. The first step to becoming a volunteer at Inner-City Arts is to fill out our online volunteer application. Once you have filled out an application, you will receive an invitation to attend an on-campus orientation. Additionally, by submitting your volunteer application, you will be added to the Inner-City Arts volunteer network and can expect to receive a monthly volunteer newsletter. All volunteer staffing for Inner-City Arts is conducted via email. To sign up for an opportunity of interest, simply reply to the newsletter. Volunteers at Inner-City Arts take on a variety of important roles across campus. Read below to learn more about each form of support. Each year, Inner-City Arts hosts a variety of fundraising and community outreach events in order to more deeply engage our constituents and sustain our programs. SUMMER ON SEVENTH is our annual music, art, and dance party! One Saturday each summer, over 1,000 Angelenos converge at the corner of 7th and Kohler to celebrate the work of Inner-City Arts by enjoying live music on our rooftop, gourmet food trucks, drinks, open studios, art installations and more. Volunteers support this event by assisting with set-up, greeting, check-in, traffic flow management, food/drink ticket sales, open studio oversight and tear-down. IMAGINE AWARDS is Inner-City Arts’ signature fundraising event held each Fall, during which we pay tribute to an individual and/or group of individuals, whose extraordinary support enables Inner-City Arts to fulfill its mission. From registration to production to hospitality, volunteers are integral to making this event a success. Rosenthal Theater volunteers are utilized for our on-campus community outreach productions such as The Big Orange Door series, Inner-City Arts Repertory Dance Company performances, Youth Performance Ensemble shows, and more. Theater volunteers support by assisting with event set-up, workshop facilitation, backstage support, and ushering. Administrative volunteers support Inner-City Arts’ behind-the-scenes needs! Opportunities of this type span from providing phone coverage for our Administrative Associate to assembling folders for Professional Development to providing data entry assistance for the volunteer program. Professional guidance opportunities are available through Work of Art, a career and college exploration program for Inner-City Arts Institutes students. Each year, Work of Art offers it participants access to a variety of college and career preparedness seminars, which benefit from the support of volunteers in the creative economy. THE CREATIVE CAREER FAIR, which takes place each fall, plays host to a variety of professionals from within the creative sector who visit the Inner-City Arts campus to discuss their work with interested middle school and high school Institutes students. Participation in this event requires setting up a “booth” on campus, distributing a mock itinerary of a typical day in your profession or any other helpful handouts, and answering student questions about your profession. CAREER SHADOW DAYS take place annually during LAUSD spring break to provide Work of Art students with the opportunity to preview professions that pique their interest. Participation in Career Shadow Days entails hosting at least one student for a full work day at your workplace in addition to providing them with informational interview opportunities. 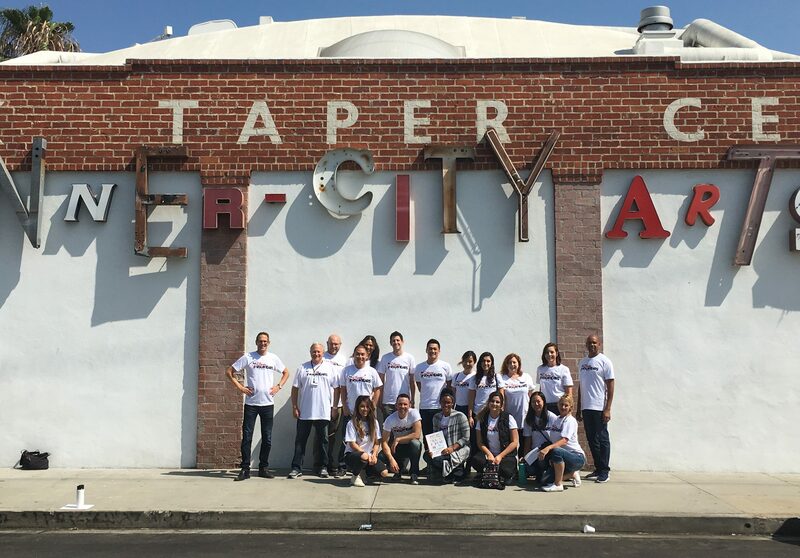 At Inner-City Arts, we are always delighted when companies and organizations choose to engage more deeply with our mission, our work, and our students through volunteerism! Opportunity descriptions for a few regularly occurring needs and events suited for groups are included below. Learning and Achieving Through the Arts (LATA) provides experiential instruction in the visual and performing arts for K-8th grade classes from the LA Unified School District and local charter schools. Volunteers work alongside teaching artists to support students as they explore their own creativity across all 7 of our studios: Visual Arts, Ceramics, Creativity Lab, Media Arts, Drama, Dance, and Music. Studio volunteers must possess willingness to integrate into a classroom setting, comfort working with young students, and enthusiasm for the arts! K-8th grade students are on campus M/W/F 9:00 am - 2:00 pm and T/Th 9:00 am - 12:00 pm. This experience is ideal for groups of 7-14 and can last anywhere from 3-5 hours depending on your availability and desired experience. We recommend a minimum $1,000 donation when participating in group studio volunteerism. The Rosenthal Theater is a creative home for innovative and diverse performance, education, and artist engagement that seeks to nurture and illuminate the creative spirit of young people and adults by enabling them to create, present and experience new work. Rosenthal Theater volunteers are utilized for our on-campus community outreach productions such as The Big Orange Door, Behind the Mic, Inner-City Arts Repertory Dance Company performances, Youth Performance Ensemble shows, and more. Theater volunteers support by assisting with event set-up, workshop facilitation, backstage support, and ushering. Theater volunteer opportunities take place on evenings or weekends and are typically suitable for groups of 7 -20, depending on the projected amount of attendees and pre-performance workshop needs. Each year, Inner-City Arts hosts a variety of fundraising and community outreach events in order to engage our constituents and sustain our programs. Large groups of volunteers are needed to support Summer on Seventh in June, Imagine Awards in October, and Makers on Merchant in December. Each of these events takes place on an evening or a weekend. Volunteer tasks at fundraisers include set-up, greeting, check-in, directional support, and guest hospitality. Your group may compose any portion of the total amount of volunteers needed. Please email Volunteer Coordinator, Madeleine St. John, at madeleine@inner-cityarts.org for more information on current opportunities for group engagement! What is it like Volunteering with Inner-City Arts? I volunteer at Inner-City Arts because it's the best place. Period. It's a little creativity oasis that fuels the arts for children in an underprivileged community. Inner- City Arts reminds me that the arts must be essential in our education curriculum. It's an inspiration. It's fun. I love the people. And when I complete my volunteer assignment, I'm that much more of a creative artist myself." their creativity, smiles, and curiosity. It's always an honor to witness their achievements and the support they receive from the caring staff and instructors. I am always amazed at Inner-City Arts' dedication to enriching the lives of children and youth in Los Angeles. I am grateful for the opportunity to volunteer at such an amazing place. It's a source of hope and inspiration." and experience first hand how wonderful this program really is. I would like to add that I wish all children could also benefit from this very enriching and worthwhile program. I firmly believe the world would be better place if the arts and character development were accessible for every child at every school/grade."